Ahmet Alp Balkan on the Microsoft Azure team reflected on his experiences at Microsoft. His experiences do not exactly match mine (initially on LINQ to SQL, then Entity Framework and finally xbox.com) but I recognize some of his points. Here is some further discussion along with some other thoughts that have come up over the years. A lot of these don’t apply just to Microsoft and some are useful for people new to the industry to think about. People think of Microsoft as a single entity with a sole focus and one opinion. That’s about the worst mistake you can make. Microsoft is like hundreds of small companies that often work together but sometimes against each other. They have different processes, dynamics, attitudes and goals not only within the same division but also within the same building or floor. Thinking your experience with one team is a reflection of the whole company is short sighted. Microsoft employs almost 100,000 people including over 40,000 in the Redmond area alone. It’s like a small country. Documentation can sometimes be found checked in with source code, in wikis, buried in Sharepoint sites or OneNote. Wherever it may exist it will be out of date by the time you find it. Documentation can only be up to date if the code never changes or you have a team of incredibly rare developers who like to read and write documentation more than code. Don’t fret unless nobody has the source code. It might appear that people are critical and dropping dead will kill the project because everything gets funneled through one or two people but that’s not the case. Many people know more than they let on but don’t want to be involved on a day-to-day basis because they have moved onto something better. When a dire situation arises these people step up. It’s true not everyone you meet will be interested in quality software engineering. Some people just want to get the job done and go home. That happens across and all walks of life. It’s a personal choice. Ask yourself how many engineers you meet are passionate about delivering great experiences to users. Do they prioritize their own wants and desires such as a high test coverage in a rarely-regressed area over a simple useful feature many users are asking for. Software engineering is a means to an end. Your customers aren’t interested in software engineering. They want a useful tool or something entertaining. What you want is to be able to sustain happy paying customers. When you’re coding for yourself you are the user. You can make the decisions quickly and know what you’re asking of yourself. There is no communication overhead. When you work with customers that slows things down especially if they’re not easy to get hold of. Most of the time you work with a project or program manager (PM in Microsoft speak) who advocates for the user. This speeds up the simpler decisions but complex or difficult decisions will still require time. With more developers, testers and partners the communication overhead increases. You make educated guesses and perform iterative steps and keep everyone involved. If those guesses are wrong they should show up quickly. You can address those wrong guesses before too many features, code or documentation rely upon them being implemented wrongly. If a decision can’t be easily reversed in the short term the it needs discussion. That takes time. Two hours of coding a day can be fine. If it takes the product in the right direction. Whether you contribute code back to the outside world is defined by your personal goals and the team around you. Some teams like the ones on ASP.NET MVC and Entity Framework have completely opened their stacks. Other teams have contributed back to existing projects. Your might not be able to do either… yet. Things are changing at Microsoft as these projects show and it can take patience and perseverance to make it happen. If your code doesn’t give you an edge then why are you writing it? Intellectual challenge? Do that on your own time. If something open source already provides important functionality you need to get permission to use that instead. Don’t give your competitors your edge while it counts. Shipping good products leads to success. Waiting for perfection leads to failure. Shipping is everything. True, it’s not always first-to-market that wins but being late won’t help unless you have something that’s radically different. A lower bug rate or a slightly more polished experience won’t be enough. It’s incredibly easy to ship updates today. Concentrate on getting the features usable and ensure it doesn’t harm the user. That means no corrupting data or major security issues. Your product will ship with bugs. If you have a good test team you’ll know what some of them are. Fix the critical, the blockers and the high-priority as best you can. Your competition isn’t going to wait, nor are your users. The more easily discovered or hard to work around a bug is the quicker it will be found. A hard-to-reproduce bug that’s easy to work around isn’t worth the time you already spent thinking about. 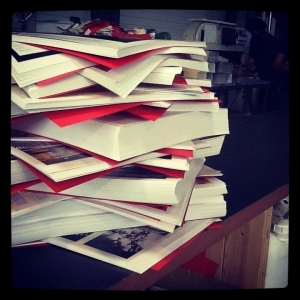 Starting a shared library between teams requires an intentional co-ordinated effort. When a team modifies a shared library do they know how it affects other teams? No. Will the other teams be carefully monitoring the shared library? No. Copy and pasting is fine for odd classes. You get code re-use without having to set-up merging, policies and ownership. Fixing a critical bug in shared code always requires co-ordination between teams whether they copy and pasted the code or whether they take a shared dependency. Bugs can hide bugs. Fixes can reveal more bugs. There are a few things people want to get out of a code review and how well it goes depends on the people interested in reviewing the code. How well did I implement this feature? We’d all love to know this but it’s the hardest thing for somebody to critique in a code review. They probably don’t know the requirements well and unless they’ve been in that area of code lately they probably don’t know what the alternatives are and why you went with this approach. To know as much as you do about implementing this feature they would likely have needed to have spent as much time on it as you. Code reviews rarely provide good feedback in this area unless you’re new to the team – in which case you should probably have pair-programmed instead and had a better experience. Are there any glaring bugs? If you’re a professional you should have read your code back and forth several times and probably refactored it until it looked good. If regular bugs or code reviews point out issues then you need reviews for this. Some people are much better than this than others – it’s one of personal discipline. You should spend far more time reading your code than you did writing it. This is about the best thing you can get out of a code review. People know arcane little bits about the system that are probably not well known and tricky to document. If you’re working in code that is called all over the place go for the code review especially. I’d be lying if I said I had a code review for everything I did. Sometimes you know the code base like the back of your hand and there are plenty of checkpoints further in the process as well as other eyes constantly on the code-base. A lot of open source projects work well this way. You’re in a rush. That’s exactly when you need it most. Send it to multiple people and wait for 1 or 2 responses – it parallizes well. The code is used everywhere. The more callers, the more places to fail. The code accesses sensitive data. Patching after a breach is too late. At the end of the day ask yourself “Could this code damage the reputation of the company and therefore my career?”. If the answer is YES you need a review. When new markets and opportunities appear it often doesn’t belong to one team and many teams can find themselves in the same space as executives go for the land-grab. This behavior is actually encouraged at all levels in the annual reviews … “expand your influence”. Unfortunately this often results in customer confusion, especially as products expand and subsequently overlap. LINQ to SQL and Entity Framework are my own personal experience this but I’m sure you think of plenty more. Conversely once a market is owned by a team it can stagnate quite quickly. Microsoft Billing and the MVP/MCP portals spring to mind. The latter requires Internet Explorer only to function. In compatibility mode no less. There are more than a few Microsoft web sites looking very dated. Be aware of what other teams are doing and how it impacts yours. Treat teams in similar spaces as potential competitors but remember that their public failures reflect on the whole company including you. The article reminded me of one from a year or two back where somebody left Microsoft after a promising start that turned into a series of bad reviews after he started trying to change things by pointing out to people what’s wrong. Microsoft like other big tech companies has a lot of smart people working for it. Smart people are busy. Going around telling people that they’re doing things wrong or that things need to change without a plan is never going to make you friends or cause change. Guess what. Career progression is part popularity contest. Worried the new site has so many hands it’s going to be a mess? Don’t complain, do something. Figure out a solution that also solves pain for others so they’ll buy in. Work with the designers on a grid based PSD template, codify it into CSS, check it in and get it included on every page. Sacrifice a few lunchtimes to train the team on it. Get it done. Think the approach you’re taking for security isn’t enough? Liaise with experts, find the issues, develop or adopt libraries, tools and techniques to make the problem go away. If you interface with customers directly through one of the many partner or support programs or indirectly through forums and Twitter you’ll see upset customers. It’s hard, but it applies to all products. Upset people forget there are real people working hard on the product they use. That if they scream and shout they’ll get what they want. It doesn’t work that way. You will come across good ideas, suggestions and feature requests internally and externally. Take the time to distill them down into small useful bite-sized pieces. Take from the critic’s what you can use for a better product and forget the rest. People develop for themselves and what makes a great solution for them might not be for other people using your product. Teams can be resistant to fully-baked solutions being handed to them. Come with bite-sized pieces and a few ideas on how they could interact. Let the solution flow out of discussion and debate. The result will be better than what you could come up with anyway. This is even more important when dealing with other teams. 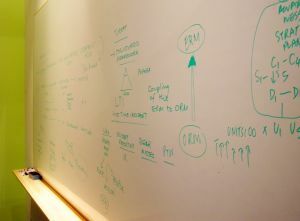 They know their internals, other customers and future road-map better than you do. Whether you’re an MVP or wrote a best-selling book joining the team behind it means you’re about to become a different type of expert. You’re an expert on using the product. On the features that shipped. On the way it’s used. You are about to learn is why the product is shaped that way. The hard decisions, the cut features, the implementation and constraints. Brace your ego for impact. It doesn’t matter that you can write any kind of LINQ query off the top of your head and have used it in several apps. When you join the team behind it you’re in for a crash course in expression trees, compilers and query reduction. How far down does the rabbit hole go? All those great ideas and suggestions you had as a user? Be prepared to find out 99% of them aren’t original. There are reasons why they’re not there. Ideas are cheap. It’s now your job to figure out how to make them happen. Execution matters. Don’t get me wrong, I loved working at Microsoft. It’s an exciting place to be with so many cool things going on. Leaving was a hard decision motivated by factors not on this list. Like any job there will be challenges. Some unique to Microsoft, some big-company specific and some near-universal that you may be experiencing for the first time if you’re new to the industry. One of the great things about working for Microsoft was the sheer breadth of the company means there are lots of cool and interesting things going on that you can peek into even if it’s not your area. With a few exceptions your Microsoft badge gets you into the whole campus (some of the Xbox studios and the executive floor are exceptions). 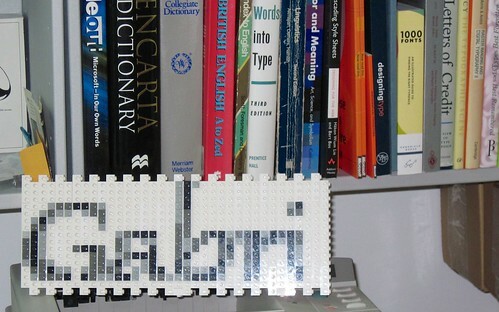 As many people know I have a bit of a passion for typography and the Microsoft typography team are a very nice bunch of people happy to humor a crazy enthusiast. Before I left I paid one final visit to the typography team to snap some cool pics. Here they are, admittedly a couple of years late, with some additional typography-related snaps from elsewhere on campus. Gabriola rendered in 4 level (2bpp) grey-scale using 1x1x1 LEGO pieces. 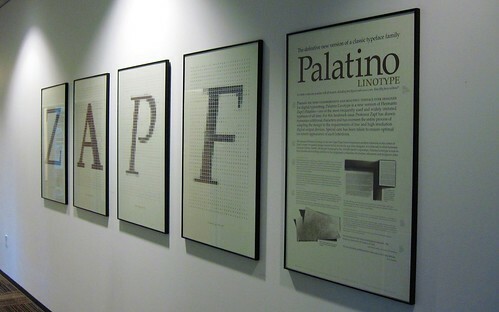 Microsoft, Linotype and Hermann Zapf collaborated on Palatino Linotype and these beautiful posters commemorate the occasion. The old Windows Start button in its pixelated glory alongside the Blue-themed XP replacement presumably rendered in Photoshop. 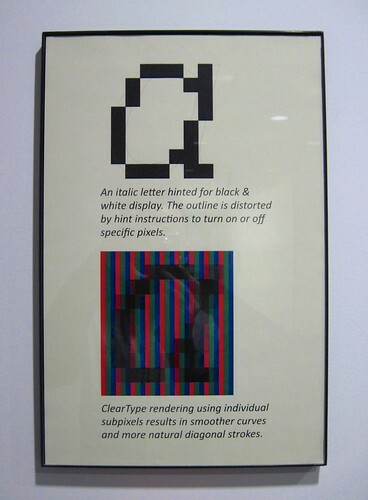 Poster showing an italic single-story a aliased and then rendered with ClearType. 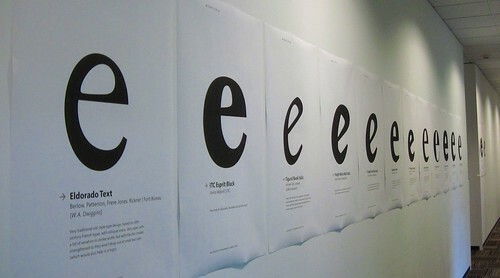 Lots of lower-case ‘e’ glyphs from various fonts on display in one of the Windows UI buildings. Simon Daniels on the typography team has his surname in steel cut in Segoe. 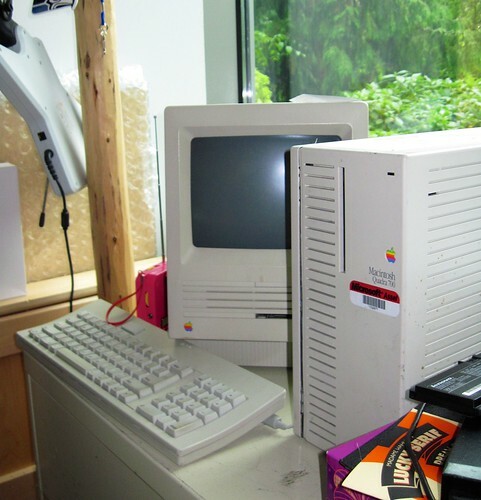 The Mac Quadra that Vince Connare used to create the polarizing Comic Sans. Microsoft’s XNA has had a bit of a bumpy journey but it does have a very cool logo with some subtle typography. 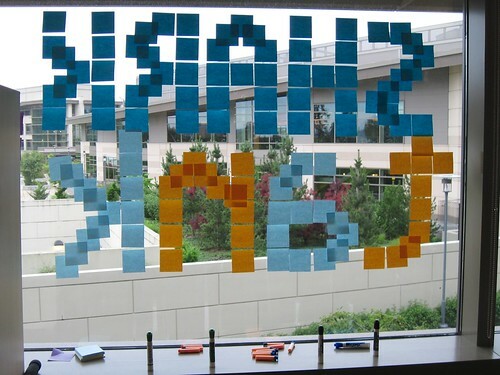 In our own Shark Tank scrum area we used the time-honored tradition of sticky notes to create pixels for our own sign. Sub-pixels were added later. 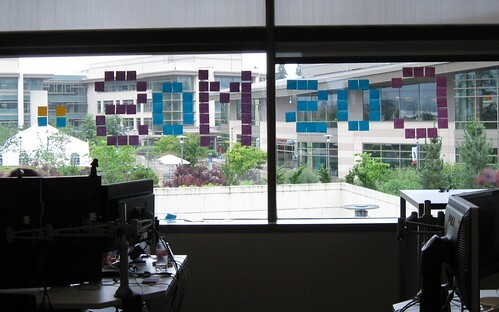 Our content management system’s sister team had their own sticky note sign too. 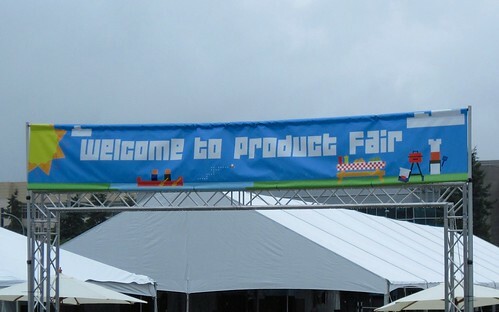 Even the product fair can’t resist some blocky 8-bit inspired fonts. The counter behind the Microsoft company store is an explosion of typefaces. Check out Guerilla pixels via John Berry too. 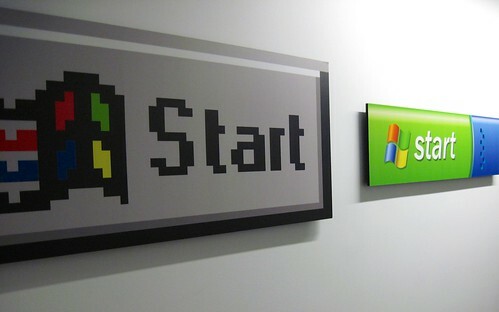 You can see the full set including a few more shots, Sonic the Hedgehog and Lara Croft at Microsoft Campus on Flickr.